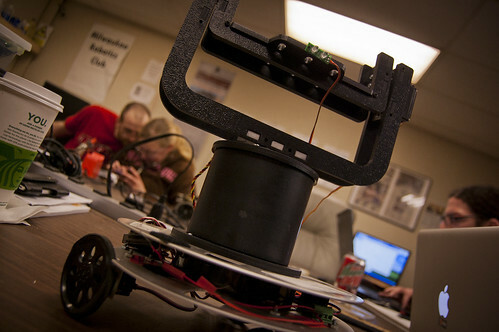 I attended the Milwaukee Robotics Club Meeting on May 21st, 2011 at the Milwaukee Makerspace. 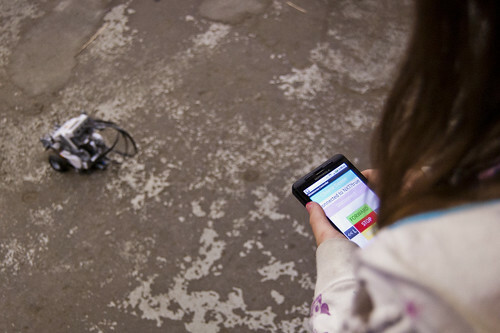 There were a handful of people in the electronics lab working on various electronics and robotics projects. 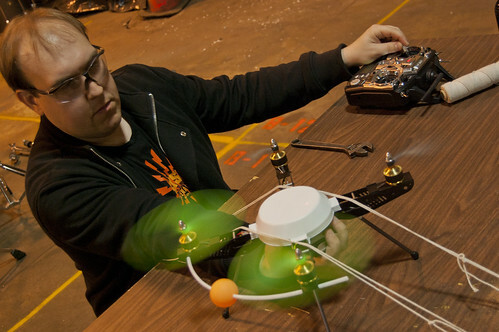 David had a quadcopter assembled, and was doing some early testing. He started out with it tied down to a table and after things seemed to be working, he ended up doing a short flight. It looks like getting the hang of flying it may take some time, but it’s a pretty cool looking project. As for me, I continue to work on Drawbot, mainly the actual programming of it. I got there late and had to leave early, so I didn’t get too much done, but it was fun and inspiring to see what everyone else was working on. Royce also said that he’s willing to help anyone who has a project started, or in mind. He’s sort of the robotics expert around the Makerspace. I believe meetings will be the third Saturday of each month, from 1pm to 4pm. I’m pretty sure I won’t make it in June since it’s my birthday, but stop by if you can and see what’s happening.